It’s almost ironic that Peter King, one of Nigeria’s best musicians, is better known in Europe and America than in his home country. Peter King’s is widely regarded as one of Nigeria’s most talented musicians. His name is synonymous with his Miliki Sound, a captivating fusion of African musical genres and influences. Miliki Sound was also the title of Peter King’s 1975 debut album, which was recently released by the Brighton based Mr. Bongo Records. This was the first of seven albums Peter King recorded between 1975 and 2002. However, there’s much more to Peter King’s career than seven albums. Here is a man who invented a musical genre, founded his own musical school, studied at London’s prestigious Trinity College of Music and performed in the middle of a war zone. Then there was Peter’s time as a member of the African Messengers who doubled as a backing band for Diana Ross, The Four Tops and The Temptations. Action packed describes Peter King’s long career, which I’ll tell you about. After that, I’ll tell you about his 1975 debut album Miliki Sound. Born in 1938 in the Enugu region of Nigeria. Growing up, he moved between Lagos, Port Harcourt and Lokoja. Then in 1957, aged just nineteen, Peter moved to Ibadan and joined the Roy Chicago Band. Initially, he was playing double bass andalto saxophone. After this he joined other bands in Ibadan and later, Lagos. Soon, he was playing double bass, drums and alto saxophone. When the time came to spread his wings musically, he headed to London. 1960 saw Peter moved to London to study music. He played saxophone, flute, piano, drums, double bass and violin when ge studied at various colleges. This included the Central School of Music, the Guild Hall in 1961 and Trinity College of Music in 1963. Graduating in 1966, Peter formed his first band in London, the African Messengers. Following his graduation Peter met trumpeter Mike Falana and drummer Boyo Martins. Together, they became the African Messengers. They were they prolific group. Not only were they a prolific live act, but released numerous singles. Their best known single is Highlife Piccadilly. When they were neither playing live nor recording, they were the backing group for many Motown artists. Among them were Diana Ross, The Four Tops and The Temptations. Not content with playing in one group whilst in London, Peter King formed the Blues Builders. 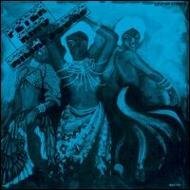 Like the African Messengers, The Blues Builders were a prolific live band, playing all over Europe and north Africa. However, when Peter returned home in 1969, he formed another group. On his return home to Nigeria, Peter’s formed another group, Voice of Africa. At one point, they even played in the middle of a war zone during the Nigerian Civil War. Voice of Africa were short-lived. When Peter returned to London in 1971, it was with Shango, his latest band. They toured Britain, Europe and America, further reinforcing Peter’s reputation as a musician. By 1971, critics were comparing Peter to some musical legends. His playing style was compared to John Coltrane, Gene Ammons and Sonny Rollins. Key to this was his ability to improvise and his tonality. Like Trane, Peter is the consummate professional. Even when he kicks loose, his playing is copybook. No wonder. Peter King was into his third decade as a professional musician. One thing he hadn’t done, was record a solo album. He would rectify this in 1975. Indeed, for the next couple of years, Lagos studios were home to Peter King. His first album was Miliki Sound, which I’ll tell you about. For Mikki Sounds, Peter King wrote and arranged six songs. He played tenor and alto saxophone, flute, piano, violin, percussion and sang. Accompanying him were trumpeter Eddie Tantan, alto saxophonist Dudu Pukwana and tenor saxophonist Mfon Idem. Sonny Roberts produced Miliki Sound which I’ll now tell you about. Opening Miliki Sound is Jo Jolo, a track that will be recognizable to anyone with a passing interest in Afrobeat. It’s an explosion of joyous music. The rhythm section create a pulsating, pounding beat, while percussion, piano and stabs of growling horns accompany Peter’s impassioned, pleading vocal. As the vocal drops out, the bank lock into the tightest of grooves. Then taking centre-stage is Peter and his trusty saxophone. He unleashes a frenzied, frantic solo. When it drops out, as if spent and exhausted, percussion, flute and his vocal pick up the baton. Each play their part in what is, an infectiously catchy Afro-beat classic. Boleya Koya sees the tempo drop slights. Just drums, percussion, flute and bursts of gnarled horns join forces. Soon, Peter and his band are creating another sensual groove. This is thanks to the rhythm section who provide the arrangement’s heartbeat. Peter’s vocal is heartfelt, emotive and sincere. Add to that jazz-tinged guitars, grizzled, bluesy horns and funkiest of rhythm section, and it’s a potent combination. Here elements of jazz, blues, soul, funk and Afro-beat are combined. They’re responsible to this invitation to dance, one that you neither resist nor help submitting to. Iya La Jole opens with a mesmeric and uplifting combination of percussion and stabs of blazing horns. Propelling the arrangement along is the rhythm section. Meanwhile, Peter’s vocal plays a crucial part in a track that’s best described as a carnival-esque slice of musical sunshine. Dramatic and urgent bursts of horns open Ijo Olomo. It’s as if their raison d’aitre is to grab your attention. Having done this, the joyous celebratory sound of previous tracks returns. Percussion and the rhythm section provide an irresistible rhythm, while the horns bray and blaze. Peter’s playing is peerless and flawless. Like his vocal, he plays with passion and a sense of urgency. This seems to spur his band on. They rise to his level, playing with the same energy, urgency and enthusiasm. A mass of violins, horns, percussion and the rhythm section open Elelzy. It’s an impressive wall of sound. Here, Peter plays violin which sounds slightly shrill, percussion and saxophone. Incredibly, he’s just as proficient on each instrument. As if that’s not impressive enough, he delivers the vocal. Unlike other tracks, it’s much more tender, and is also heartfelt and sincere. Then Peter’s saxophone takes centre-stage. He unleashes another flawless solo. When it’s finished, you realize just why Peter King was held in such high regard as a saxophonist by his contemporaries and peers. Closing Miliki Sound is Gvinmi Komo. Straight away, you realize that something special is unfolding. There’s a much more understated sound. Gone are the blazing horns. Instead, the rhythm section and percussion accompany Peter’s vocal. A pounding bass drives the rhythm section along. As it provides the track’s heartbeat an alto-saxophone makes brief appearance. Later, the horns braying bid a farewell to Miliki Sound. That seems fitting, given how important a role they’ve played in the album. Having said that, they’re used much more sparingly. This proves just as effective, as Peter’s vocal cajoles and encourages the band to close the album on a high. They don’t let him down. For anyone yet to discover Peter King’s music, there’s no better place to start than Miliki Sound. It’s easily his most accessible album. Not only that, but it’s truly irresistible album filled with delicious rhythms. Although only six songs and thirty minutes long, it’s an almost flawless album. From the opening bars of Miliki Sound right through to the closing notes of Gvinmi Komo, it’s a joyous, uplifting and irresistible musical experience. I’d describe Miliki Sound as a call to dance, one you can’t help but submit to. It’s almost mocking you, daring you to submit to its glorious rhythms. There’s more to Miliki Sound than some delicious rhythms. Much more. Intricate, multilayered and complex, Miliki Sound is filled with numerous subtleties, surprises and nuances. Musical genres and influences are thrown into the musical melting pot by Peter King and producer Sonny Roberts. This included everything from Afro-Beat, soul, funk, jazz and blues. Add to this Afro-Jazz, high life and wild life. It’s a glorious and unique fusion of styles and influences. Miliki Sound also proved to be a hugely influential album. So influential, that it gave birth to a new musical genre, Miliki Sound. This is a fitting tribute to the quality of music on Miliki Sound, Peter King’s debut album. Having earlier described Miliki Sound not just as an infectiously catchy, irresistible album, I’d add to that innovative, imaginative and influential. Standout Tracks: Miliki Sound, Boleya Koya, Elelzy and Gvinmi Komo. ← UNDER THE INFLUENCE VOLUME 3-A COLLECTION OF RARE SOUL AND DISCO.